For the second year in a row now I signed up for tickets for GG and I to the Dine for Life Spring Dinner. 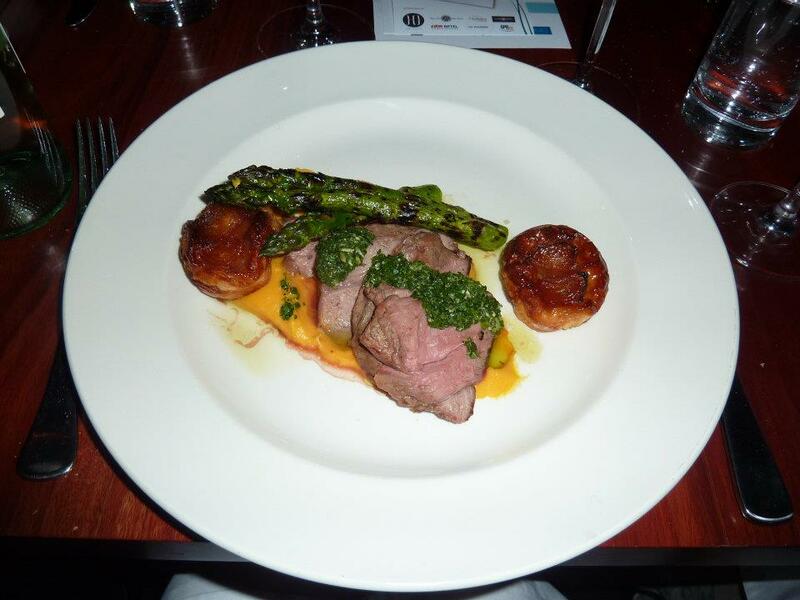 The way the Dine for Life dinner works is that they have a selection of the top restaurants aroundPerth(and also down South this year too!) and they each host a table of 10 diners for a delicious 3 course meal. The added excitement factor is that while you don’t know which restaurant you are going to until the week of the event, they are all top eateries so impossible to be disappointed. So Sunday night ahead of the dinner I received an email I was being sent to Divido. Now this has been one of my favourite restaurants of the year. Been there three times and loved every visit. So I’ll admit that my initial thought was disappointment that I didn’t get to try somewhere different. So my claim before that it was impossible to be disappointed was perhaps not entirely true. I decided I would send an email just in case to see if they might be able to switch me around. Now they are an amazing team and it turned out it was possible to arrange to send myself and GG somewhere else. I do really appreciate them doing that, noting that if I’d gone to Divido again it would not have been the worst thing but let’s face it the food is consistently brilliant, but by us swapping someone else got to find out your great the team there is. So our new restaurant was Sentinel. So I’d been once for dinner but it was new for GG so I was happy. Kicking off at 7pm we arrived just before and joined our table. We were lucky enough also to have Tony MacManus from 6pr dining with it. He was very entertaining and kept the whole table chatting. Steve Scaffadi (owner of Sentinel and Bar One – where by chance we had Dined for Life the year before) was also floating around to make sure everything went smoothly. The meal was three courses, but no dessert, which I’ll admit I was surprised about. The reason for this was revealed on flicking through the reading material we’d been given in our goodie bags. There had been a challenge for Cocktails Gastronomy to come up with a creative dessert cocktail that diners would enjoy at the after party. We started with a glass of bubbles and some delicious olives and freshly baked bread with some amazing tapenade and olive oil from Eagle Bay Olives. 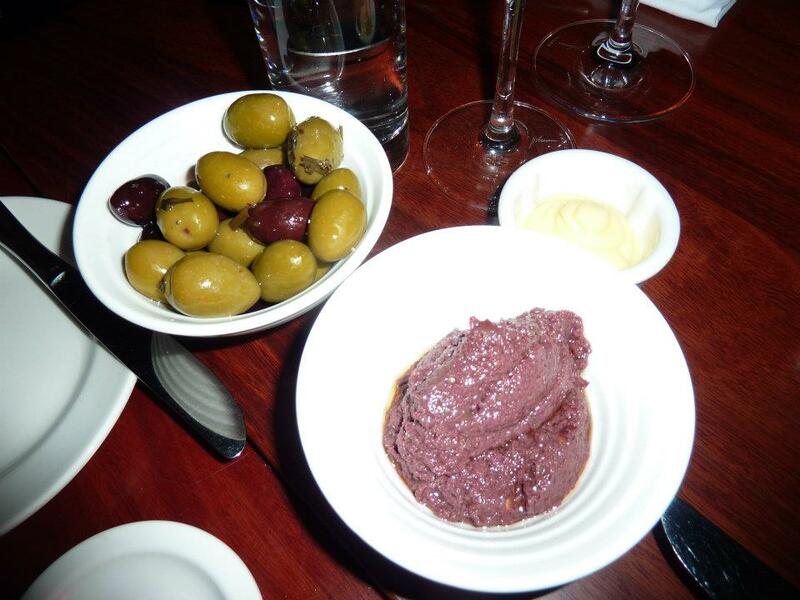 It was seriously some of the best tapenade I think I’d ever had. Had a real chilli hit through it. Tasty! Couldn’t get enough! 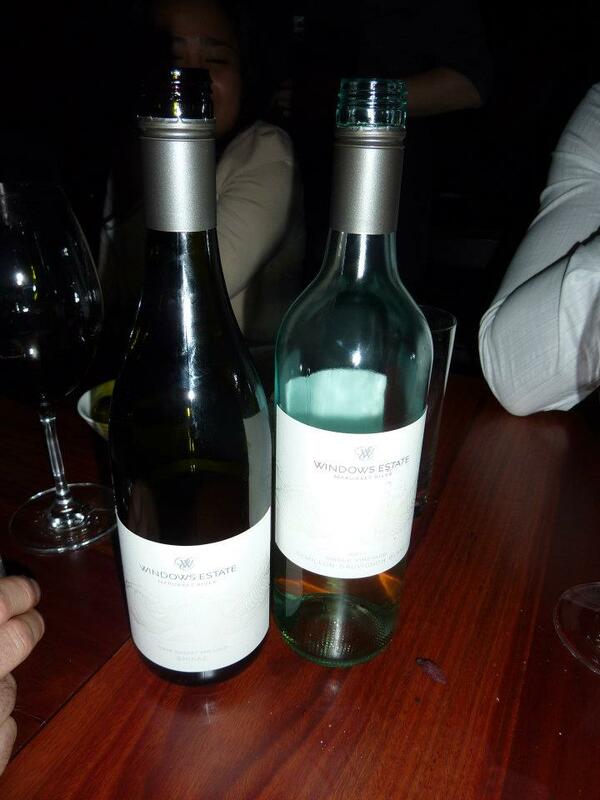 There were then a choice of red and white wine available with the three courses ahead, with thanks to Windows Estate for their choice drops. 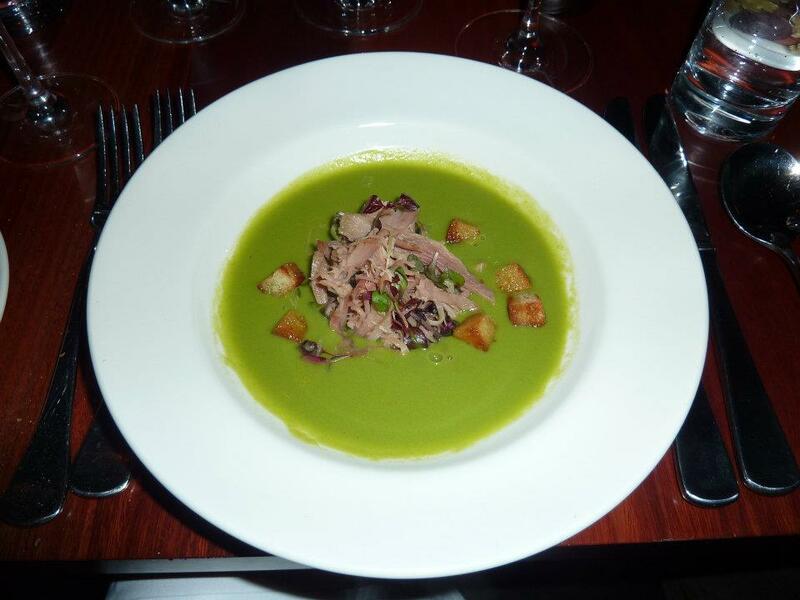 Then our first course was pea and ham soup, which may not soup all that wow, but it really was. 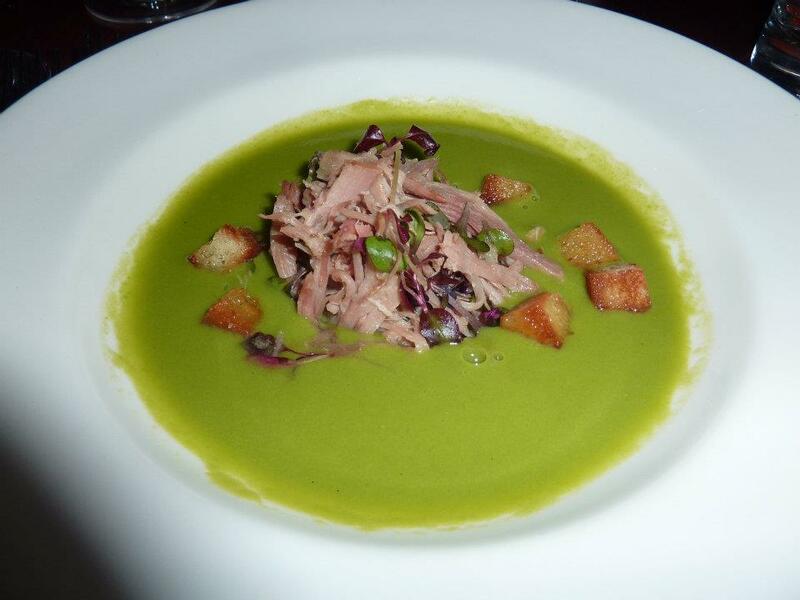 Bright green pea soup with thinly sliced ham elegantly piled in the centre. It was delicious! And I’ve never been a big fan of pea and ham soup but after this I may be converted! 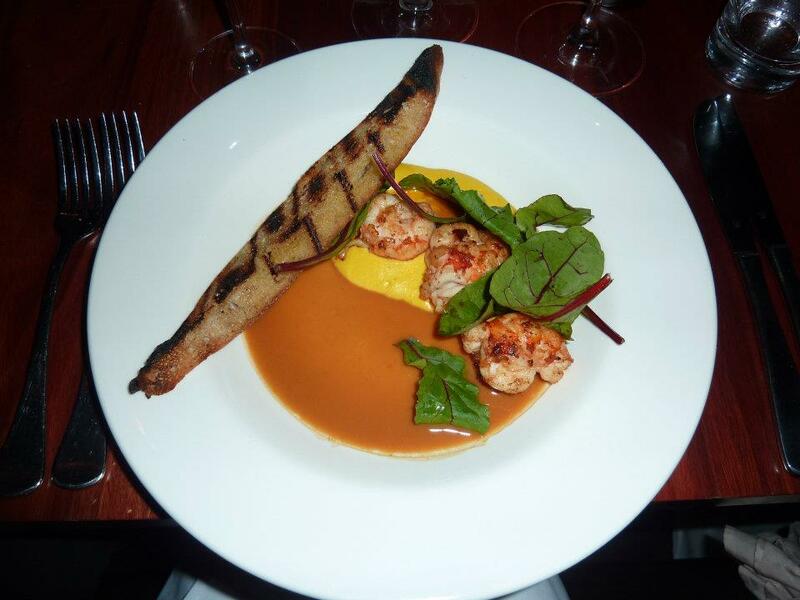 Second course as a marron dish which came with a lobster bisque. I don’t think I’m a big bisque fan. I find it a bit too strong of a seafood flavour. The marron itself was delicious though. Our final course was lamb. 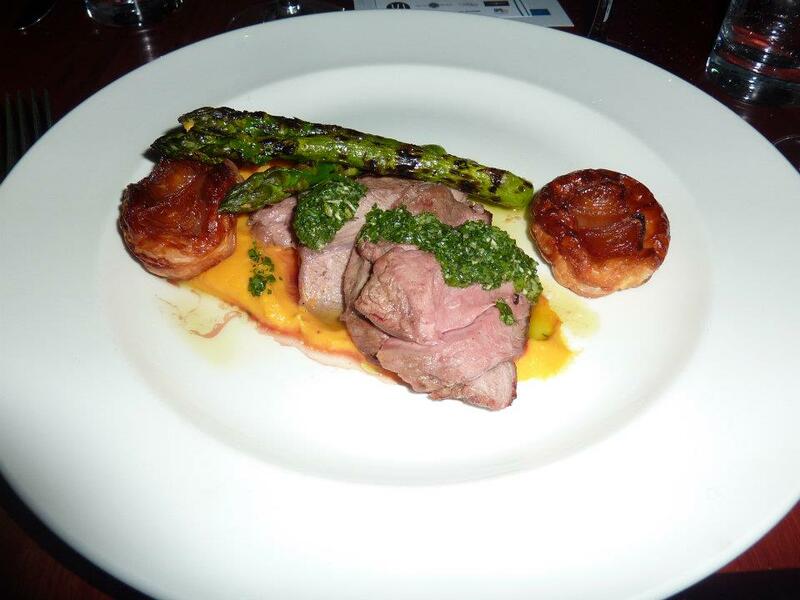 Melt in your mouth, perfectly pink lamb. And a very generous serve at that. It came with crispy greens and rounded the meal out well. I don’t think anyone was hungry after this. 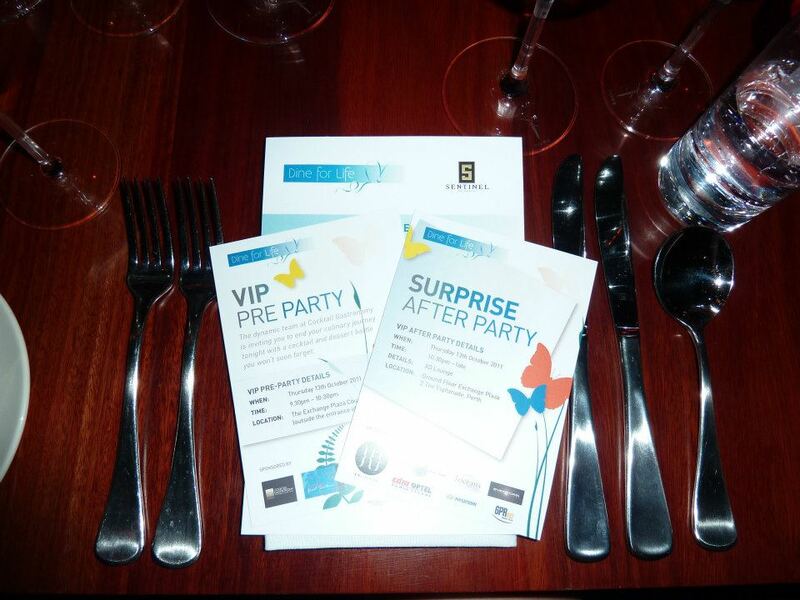 I did enjoy the meal and was feeling very well fed as the group wandered down the Terrace to the after party at XO Lounge. 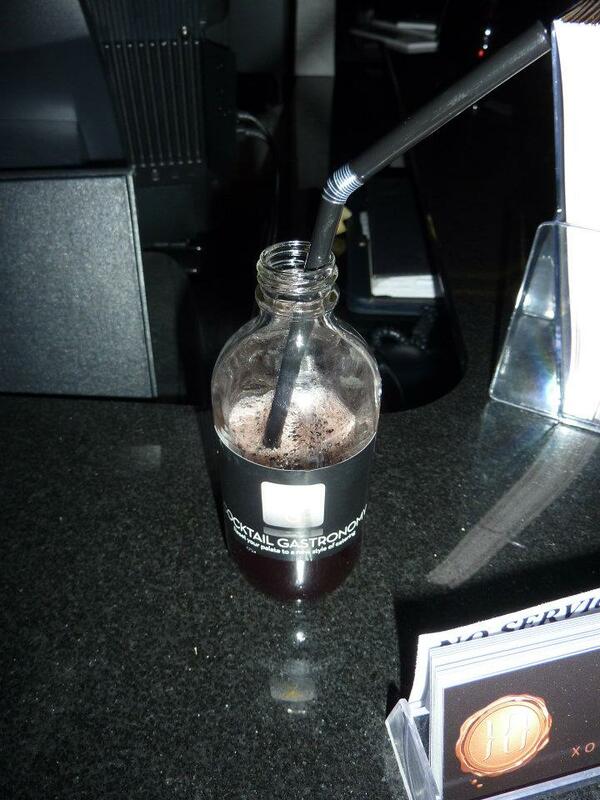 We all sampled the cocktails, which were Cherry Ripe flavoured. I’ll admit I’m not a big Cherry Ripe fan so the cocktails didn’t do too much for me, but I thought they presented very well in their little bottles. We didn’t stay too long at the after party. I’m not much of a night owl with 5.30am starts at work at the moment so this Cinderella exits well before midnight, but I had a really lovely time and met some fabulous people. And there’s an added bonus I think when eating out helps others. The Dine for Life crew do a wonderful job!